The School of Sharks is a Hydro weapon. The second revision of the Runeshark, codename: The Great Rune Shark, is improved in every way over the original design. 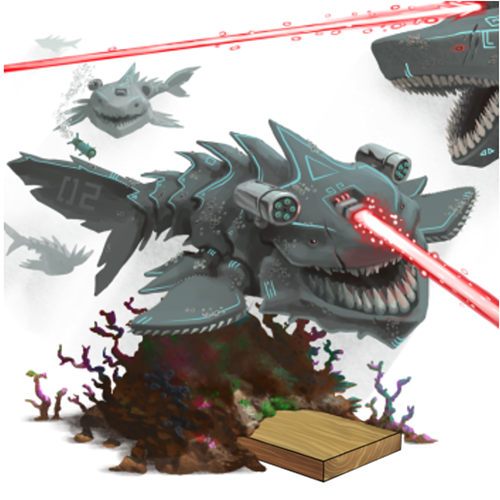 Enhanced lasers, stronger fins, sharper teeth and increased size to take on the toughest of prey. The biggest advantage: Strength in numbers! A whole school of sharks ready to be unleashed! The School of Sharks can be purchased from the Trapsmith in Sunken City for 11,000,000 gold, 800 Sand Dollars, 1 Rune Shark Trap, 3 Predatory Processors, 60 Runes, 200 Barnacles, 200 Mouse Scales, and 200 Damaged Coral Fragments, which will all be spent in acquiring the trap. It can be refunded at the same location for 1,980,000 gold. None of the other items spent to acquire the weapon will be refunded. Rune Shark Trap - The Rune Shark Trap is needed to purchase the School of Sharks. 2 July 2014: The School of Sharks was released with the introduction of the Sunken City. This page was last edited on 15 February 2019, at 20:38.